When you're not at the beach or enjoying a night of stargazing, you can bring your roundie indoors for functional decor. A few posts back we showed you a little shoot and some tips to style your Petite Roundie at home from playmat to reading nook, just so the kiddies can enjoy using their Roundie in more ways than one, and many of you asked for a demo on what you can do to style these in the home. Number ONE: choose your background wisely. We always start with a limited colour palette for an indoor/outdoor space. We want the focus to be the towel, it really should be the stand-out ‘hero’ of the space. No crazy colours here, just muted greys and natural tones all the way. Number TWO: it should all come together. Every element in the space should compliment the other elements. 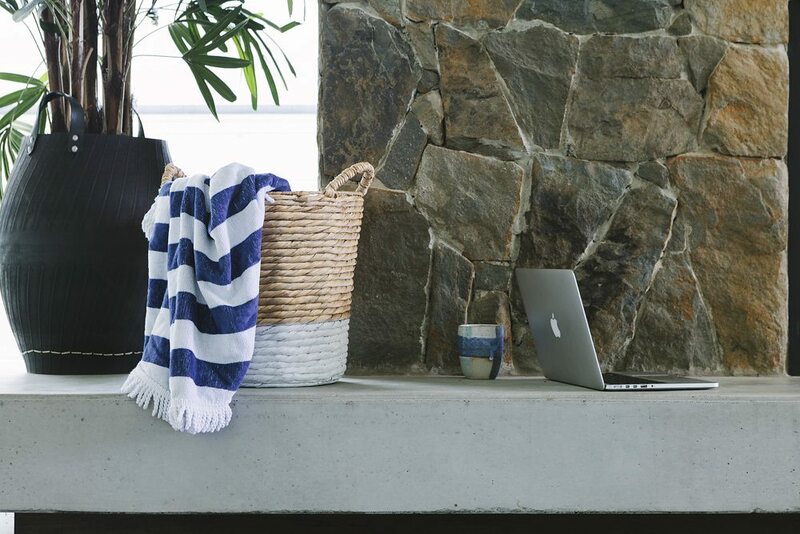 If we are using a towel in a blue colour, we’ll pop a blue mug in there to balance the composition of the room out. Balance is key. Number THREE: less is more. We don’t like to overcrowd our spaces. We take inspiration from Madame Coco Chanel when she said something along the lines of (and we are paraphrasing here), “Before you leave the house look in the mirror and take one thing off!”. The minimalists in us really love that idea. You go Glen Coco! Number FOUR: get creative and have fun with it! Throw it around, drape it, place it or fold it. Have one on hand next to the outdoor shower to create a luxe feel in the garden. Keep a few in a storage basket in the lounge room and when friends come over lay them on the floor for extra seating or an impromptu picnic. FUN!